I think I made my first cowls/snoods about a year ago. See here. They are just brilliant. A scarf without the ends. You know- those ends that get caught in doors/ disappear up sleeves/ get pulled by toddlers. They were an easy project using some chunky acrylic and an 8mm hook. If memory serves me correctly I even made one in the Noro I found in that amazing charity shop stash. You know what I mean - crochet produces quite a dense stitch and these snood/cowls could almost stand up on their own. Warm? Yes. The most comfortable? Not really. The Noro one was duly frogged for this reason. So I tried different stitches and patterns until I found one which produced a nicer open texture, based on a V stitch. But still, it was too clunky. Then it struck me. A larger hook was needed. A big hook would work more air into the pattern. How big? I hear you ask. And so, ladies and gents, may I present The Ultimate Snood Pattern. 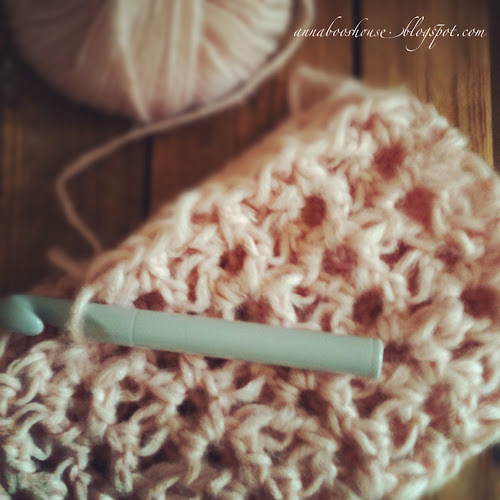 I use US crochet terms, so my Double Crochet (dc) here is the same as a UK Treble stitch. We will work from the bottom of the snood upwards in rows*. You'll need a tapestry (blunt) needle to hide any ends and to sew the piece together. 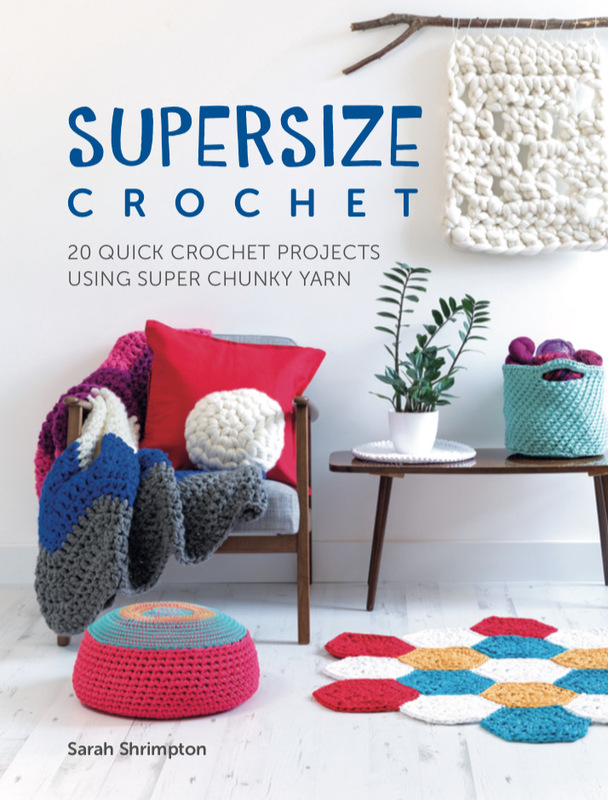 You need some super-chunky yarn (about 100g) - anything that recommends you use a 8-10mm hook (try Sirdar Indie or Big Softie) and a 15mm hook (I bought mine online) don't worry, it's made of plastic, so is light to manoeuvre and you soon get used to it. Chain 42. Now I use the chainless foundation stitch as I think it gives a good structure to the bottom of the snood, but a simple chain will do. Your chain needs to measure just over 22 inches/ 57cms and its total number should be a multiple of 3. [We are going to work in rows, turning at the end of each.] Chain 3 (counts as a dc) Turn. Make a dc in the 6th stitch from the hook. Chain 1. Dc in the same stitch. Skip 2 stitches, (dc, chain-1, dc) in the next stitch. Repeat along the row. Make a dc in the top of the 3rd chain from the previous row. Chain 3. Turn. (dc, chain-1, dc) in the chain-1 space from the previous row (the V) Repeat along the row. Make a dc in the 3rd chain from the previous row. Fold the two edges together and stitch up! That's it. It really is very easy and super-quick, too. Work chainless foundation as original pattern. 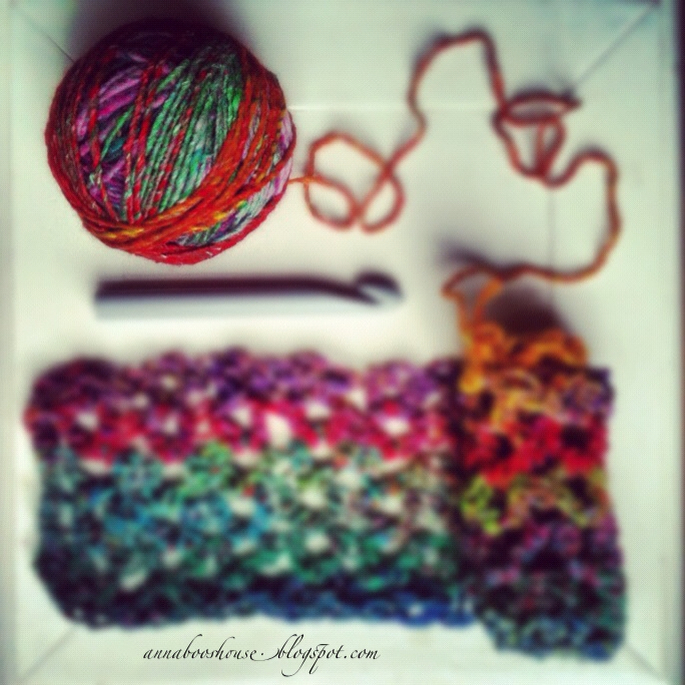 Join with a slip stitch to form a circle, being careful not to twist the chains. 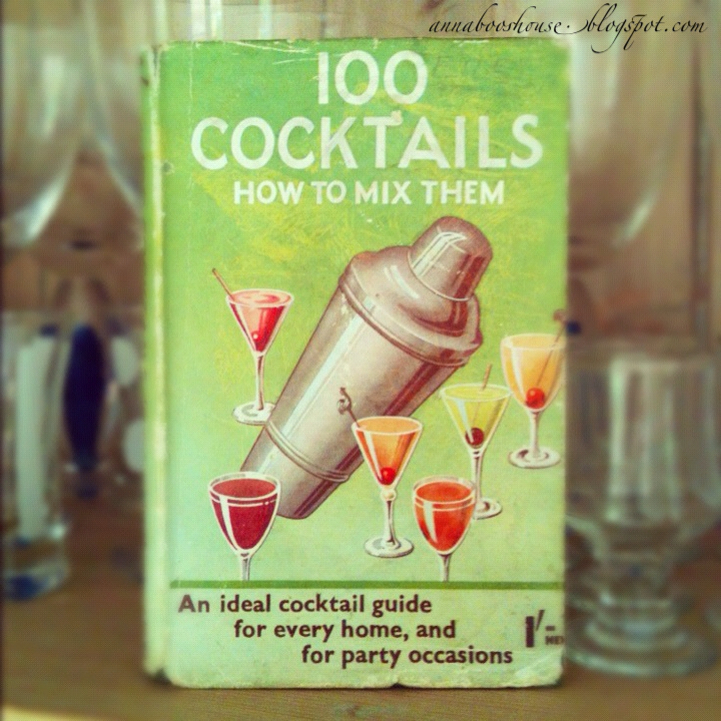 Is it ever too early for a cocktail, I ask you? Beautiful photos and crocheting - a real visual feast. Thanks for sharing! I don't have the problem with stand up cowls as I use dk yarn. I wouldn't like all those holes - defeats the object of a cowl which is keeping warm. Oh I disagree with "Anonymous". I think I will manage to crochet a cowl with your instructions. Surely her (his??!) argument could be with tights and holes. LOADS of people prefer to wear the trendy tights with a hole pattern, still keeps their legs warm! I WOULD like all those holes. I shall make one when (if) I ever get time. Exactly, I LOVE mine made with this pattern, actually someone even stole it so I'm going to make another! 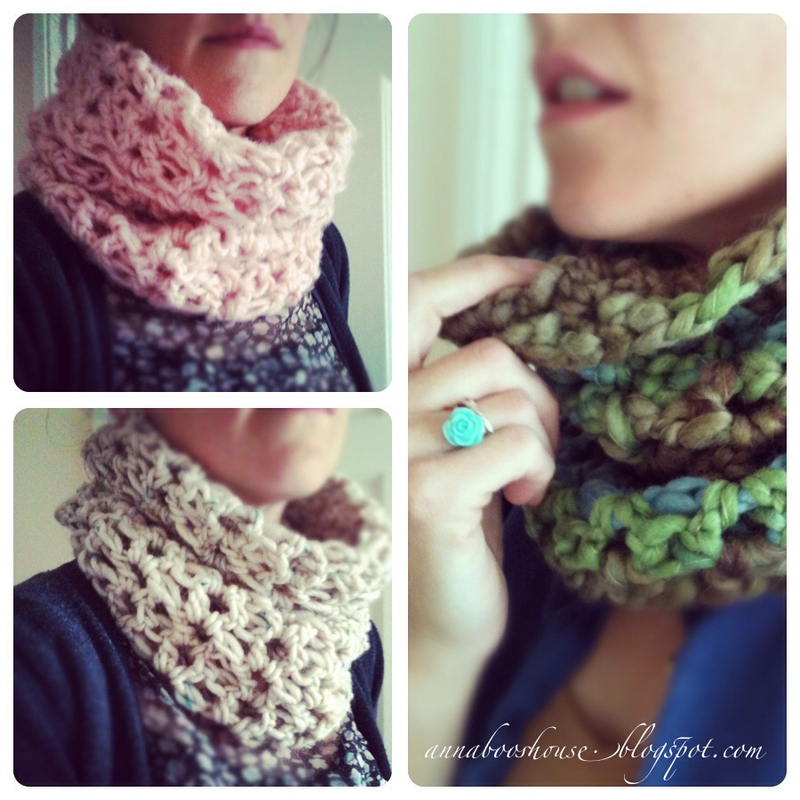 Love this idea, I made so many cowls last year and I swear there was something I didn't like about each and every one of them. Maybe my hook size was just too small. I will have to rethink that one. They do look lovely. I like my cowls to be snug fitting so they keep me cosy, I tend to keep them for winter and wear a loose scarf on colder Autumn & Spring days. Yours would be good for those kind of days too being a little looser and more open. I especially like the blue, green and brown one, can you tell me what yarn you used for it? You are, of course entitled to your own opinion. Let me assure you that my cowls, made with quality chunky yarn containing a high wool content, are super-warm, despite the holes. We are both discussing the "holes saga" and conclude that Anonymous 2 is correct that the holes will trap air to keep you warm. Not to mention it looks damn nice and snuggly and cosy and scrumptious! 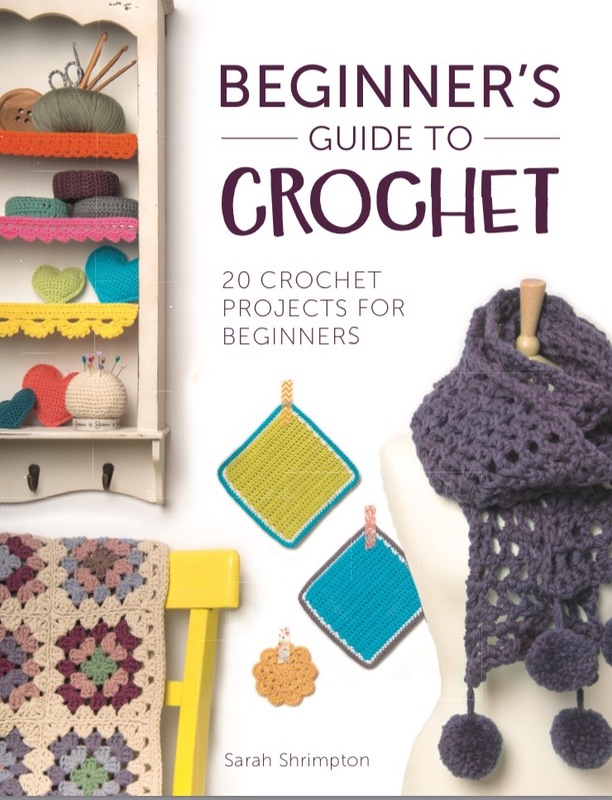 I might have to start one right away, despite my many other crochet projects on the go! Thank you for your comment- I knew that I was right about the holes!! I love your "Simon Cowls", as I like to call them. I think you should make one, especially for Simon Cowell, to hide his hideous man rug, if nothing else. You should work on an X Factor special. I always wondered about string vests or fishnet stockings and how they kept people warm? It must be because they trap air. thats why people layer up, to trap air and keep warm. this fails when the wind blows and windchill factor kicks in. this will cool you regardless of size of holes, tension etc. hence why people choose to wear a windproof layer. its nothing to do with the size of holes on your cowl, or vest for that matter! Keep up the good work annaboo! - i'd like a funky string vest now please in multi colour bamboo dk! Thanks so much for your comment- made me giggle! 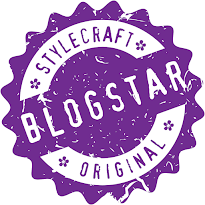 Hi Annaboo, thank you so much for sharing your patterns. 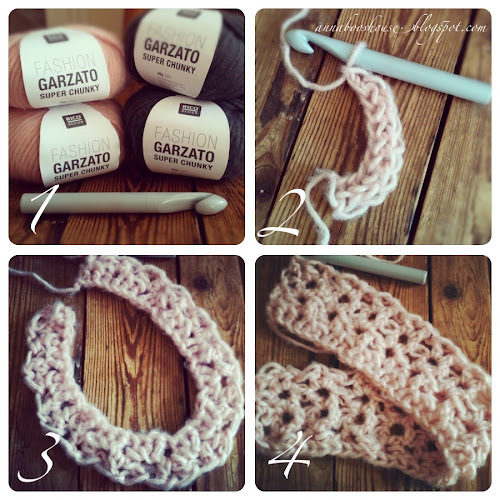 I am new to crochet and still a little hesitant to try anything too 'interesting' but this looks fairly straight forward. I'm going to give it a crack!! Oooh, they look so pretty! I bet they work up quick with that chunky yarn. I need to hunt down one of those gigantic hooks! The cowls look great...I think I'm going to try one. It's beautiful and perfectly elegant... The holes just add elegance and texture and that is agood trademark for good work. I love it ! Thx for sharing. Gorgeous! thanks for the pattern, I will deffo be adding it to my "to do" list. What a lovely pattern, thanks so much for sharing. I've never had a cowl, I thought that they would be too thick and "standupy" too, so maybe this is the perfect pattern for me! Ooooooo thanks for sharing!! 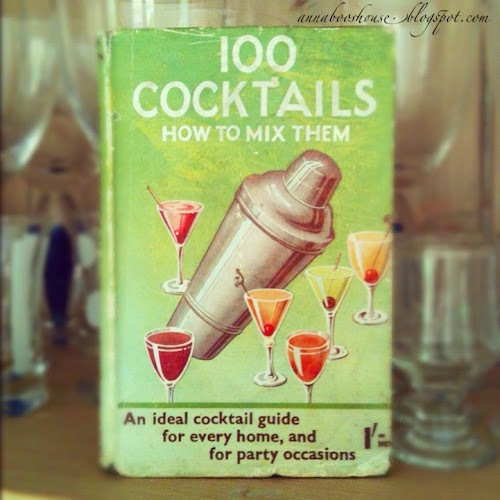 I need to find some time to make one! Looks like a fabulous tutorial! I got so excited reading this post and looking at the lovely photos . And that massive hook is fan-blinking-tastic!!! Do you reckon I'd be able to do this, dear crochet-mentor??? How tricky is it compared to the monkey? awesome pattern i'm soooo going to make this! Thanks for sharing! I tried it last night and now I can proudly wearing my new cowl :) I didn't know the chainless stitch, so I searched on the internet, tried, and now I LOVE it! Thanks again! These look beautiful! Also a fairly quick and even practical! I can't wait to make one. I actually bought a huge plastic hook for crocheting recycled plastic grocery bags into stuff. I think it will work nicely. Thanks for posting directions and the awesome pictures. I love the colors. I'm thinking my college daughter is going to love one of these when she walks to class in a freezing gale force wind LOL. I'm not sure what size yarn to use. I'm new to buying specific products for projects but I bet I can read the labels and figure it out. 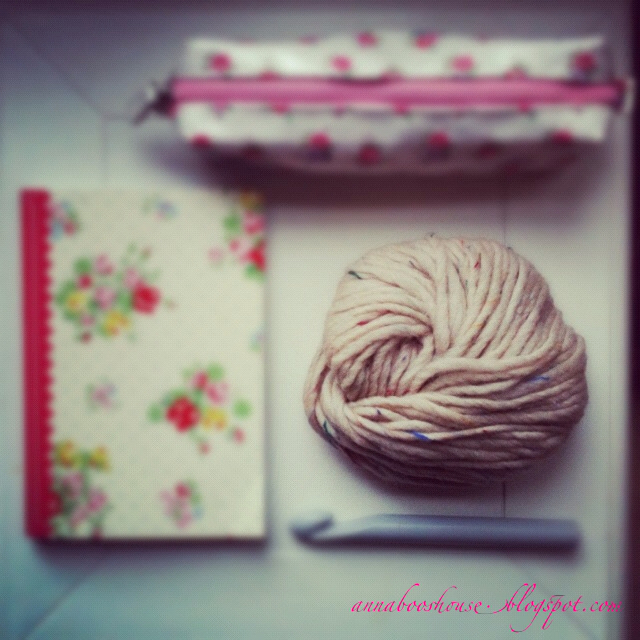 Do you know how often I sigh, on reading one of your posts, 'if only I could crochet'! Looks like a really great pattern. Terrific photos. 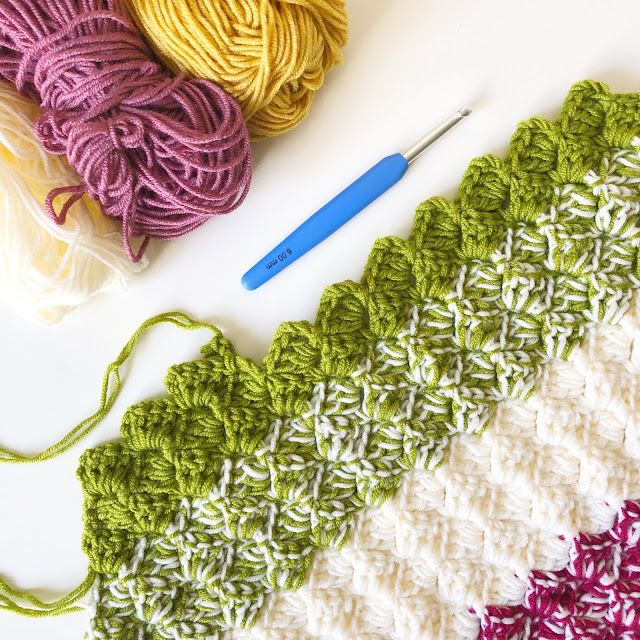 Just posted about this pattern - I love it! My cowl is going to be perfect this Autumn/Winter and the holes do not make it cold at all. Thanks for sharing the pattern. They do look lovely. Thank you so much for sharing your patterns. oh very nice ....I've been looking for something to do for my sister for the cold, she drives a school bus in Lincolnshire, it can be bitter cold on that bus I know I've been with her while she picks up the kiddies early morning. this looks quick to make and really snuggly...she likes chunky stuff too. It also means I don't distract from my 3 wips too much to do it. Thanks for sharing. 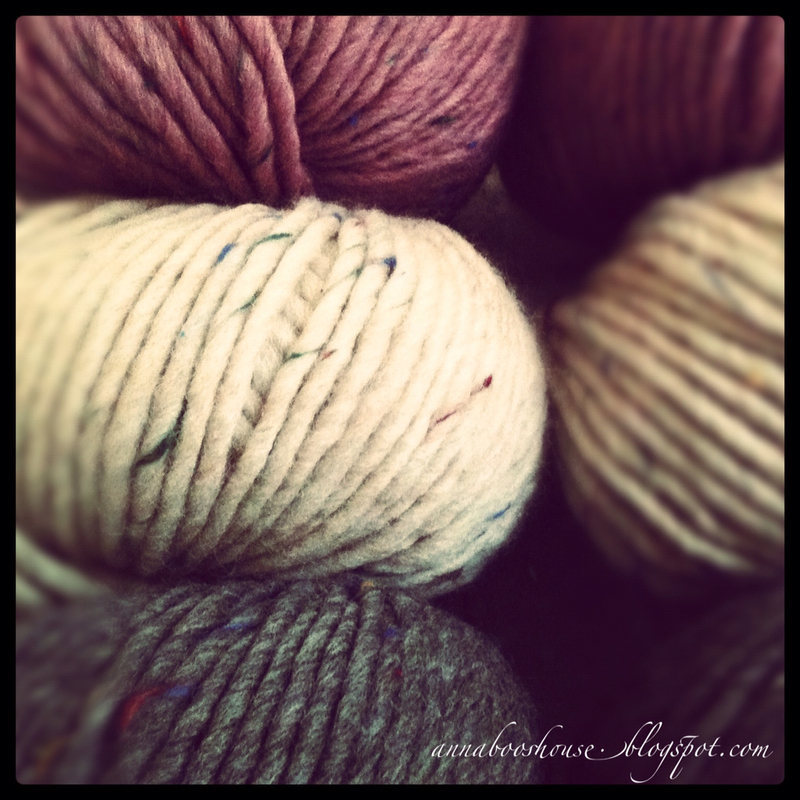 Can you please let me know what yarn is in your first picture? The bright red, blue, green, purple and orange? I love this!! Thank you for sharing it with us!! I love this pattern, still getting my head round using chunky wool and I've spent the last few days trying to find a pattern that won't make the cowl stand up, thank you! Will post it up on ravelry when done. What is the type of yarn used in the third picture down from the top of the page? It is gorgeous! Love the pattern and the scarf. Thanks for sharing! Love it! I just made mine in the round and it looks and feels great! Thank you for sharing! I've just discovered your blog via Instagram and am enjoying catching up. 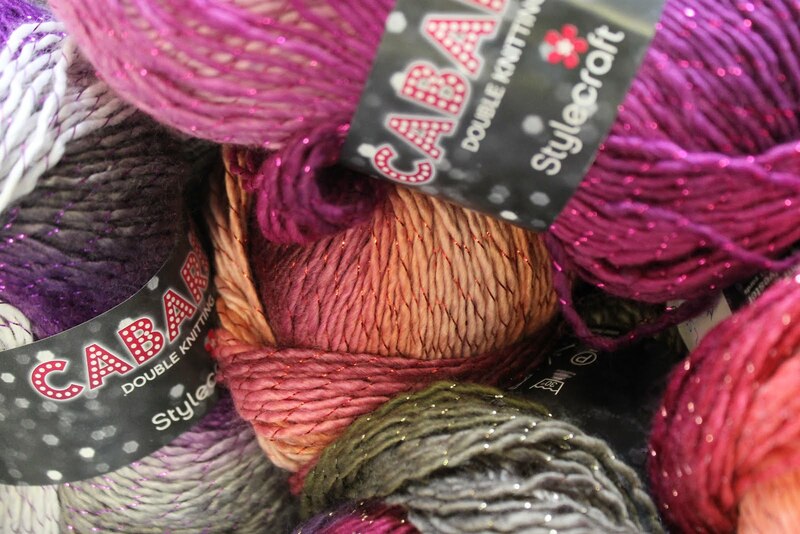 Having recently bought a cake of Batik Swirl in Foxglove, I shall definitely be using your pattern soon. Thank you for sharing it! Hi Cathy - no problem at all! Enjoy making your Wrap! Oops, meant to leave my last comment on your recent Batik Swirl Wrap post!